Keep your hearing aid operating like new! Uses dry, gentle heat and air convection to dehumidify, refresh, and sanitize. Removes harmful surface moisture and UV-light inhibits bacterial growth. Eco-friendly and more cost-efficient than chemicals or desiccants. Compact, lightweight, portable, and easy to use. Built-in battery tester and simple, one-touch operation. Holds two pairs of hearing aids at a time. Uses dry, gentle heat to remove moisture and condensation, refresh, and sanitize. Environmentally friendly; eliminates the need for harsh chemicals or desiccants. Built in battery tester—no more wasting money throwing away good batteries. Magnetic parking-spot for battery safe-keeping. Costs less than a penny per usage. 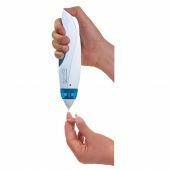 Simple one-touch operation and easy-to-open compartment, even for people with arthritis. Fits up to 2 pairs of hearing aids or cochlear implant processors. Compact and lightweight with durable, high-impact polycarbonate construction—ideal for home or travel use. Moisture evaporation rate (tested with water in a 2 mm diameter plastic tube)....... Evaporate 18 mm3 of water after 4 hours of dryinQ at 60% R.H.
Q: Why do I need to dry my Hearing Aids? A: Moisture is the leading cause of failure in Hearing Aids. Moisture degrades your Hearing Aids and its function, as well as shortens the life of your batteries over time. Moisture can also cause bacteria growth, causing earache and skin problems. Q: How does DB-100 dry my Hearing Aids? A: Hearing Aids are delicate electronics and need to be treated correctly. The DB-100 is designed to dry the Hearing Aids using gentle dry heat that effectively removes moisture without overheating your Hearing Aids. Once the moisture leaves your Hearing Aids, its ventilating design moves moisture outside of the box without the need of desiccant. Q: How is the DB-100 superior to other similar products on the market? A: The DB-100 effectively dries and removes moisture using gentle dry heat without damaging your Hearing Aids. It does not require expansive desiccants or any expensive chemicals, providing the same results at a fraction of the cost. It uses UV lights to eliminate and inhibits bacteria growth. It features a magnetic strip for you to keep batteries parked for those who do not like to have their batteries heated. 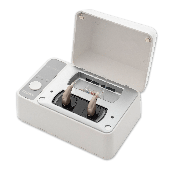 The DB-100 also has a battery tester for your Hearing Aids so you will know when to replace them exactly without wasting any good batteries. It is compact, lightweight, and its adaptor is universal. Q: What benefits can I get by using DB-100? A: Although it is hard to provide exact results since there are many factors, you can expect your Hearing Aids to last longer. By using the DB-100 frequently, you can prolong the time between Hearing Aids servicing and repairing up to 3 times longer. The UV light also eliminates and inhibits bacteria growth in your Hearing Aids, which helps prevent an earache, infection and skin disease. The DB-100 can also test your Hearing Aids batteries so you will know when to replace them exactly without wasting any good batteries. Q: Can the DB-100 remove earwax? A: It can help remove earwax by drying it. Without moisture, earwax becomes flaky and is much easier to remove. However, using the DB-100 alone cannot remove earwax. Q: How long do I need to use the DB-100 for it to complete refreshing my hearing aids? A: The amount of time needed to completely refresh your hearing aids varies. A lot of it is dependent on the humidity of your location and weather. The DB-100 features 3 different setting to accommodate different humidity level, which determines the drying time. High humidity (Hi Hum) will require a longer time than low humidity (Lo Hum). Once you turn on the DB-100, it will stop automatically when according to the setting you have selected. If you would like to extend the drying process even longer, you can turn it on again for another refresh session. Q: What is the rectangular box with the dotted line above the buttons? A: That is a spot for you to hold your batteries in place. Some users may choose to remove their hearing aids batteries when their hearing aids are refreshing. The dotted area is magnetic and holds your hearing aids batteries in place so you can retrieve them easily and will not lose them when your hearing aids are ready. Q: Sometimes when I turn on the UV light, the DB-100 stops refreshing, or when I turn on refresh, the UV lights goes out, why is that? A: This happens because there is insufficient voltage. This is caused by using the wrong power adapter. Please check if the DB-100 is connected with its original adapter. Q: I am traveling overseas and would like to bring the DB-100 on my trip. Will I need a power converter? A: No. 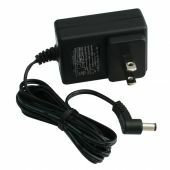 The DB-100 uses an international power adaptor that can be used internationally. If you are traveling to a country that uses a different shaped power plug, you will have to use a plug converter, but there is no need for a power converter. Q: What does the battery tester do? A: The built-in battery tester tests the battery level of your hearing aids batteries. It allows you to see an estimate how much power it has left on the power meter. By doing so, you can get the most out of your batteries before replacing them. Q: What is the frequency of the radiation generated by your UV bulb? A: The UV light wavelength ranges from 100 to 400 nm. The UV light used in ReNew is 400 nm. Hearing Aid Dryer & Freshener, will it affect the life of the battery? Q: Is there a place to keep my hearing aid batteries while I am cleaning/refreshing my hearing aids in the ReNew Hearing Aid Dryer and Freshener? hearing aids, in a safe location, so they will not become lost or misplaced. A: A UV light wavelength ranges from 100 to 400. The UV light wavelength used in our ReNew Hearing Aid Dryer & Freshener is 400. Recent Studies have shown that the 400nm UV light used in our ReNew Hearing Aid Dryer & Freshener is effective in reducing bacteria. change the color or damage the material of my hearing aids? A: Shorter wavelength UV light in the 100 to 250 nm region has a more penetrating effect on plastic than UV with a longer wavelength. Hence, we judiciously selected a longer wavelength UV light (400nm) for use in ReNew Hearing Aid Dryer& Freshener. This UV light produces no noticeable effect on either the color or material of hearing aids.